Here for the webpage (preview clip download at the moment). This old man is sitting in that chair lying through his teeth. This shows something fundamentally wrong with the current form of Nigeria's federal government... when the foreign minister can't gain access to speak with his own president at a time of crises. I think that's much of what Maduekwe left unsaid in this interview: that he hasn't been given the free channel of communication to his boss. And that is sad. Very. 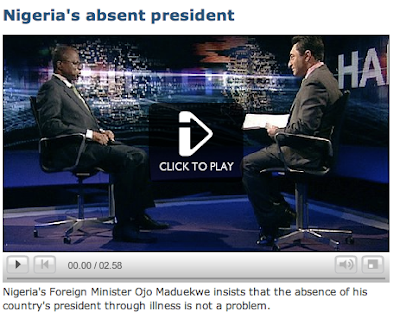 Ojo "at a miserable press conference" today at the U.N.